Start with turning on a sewing machine, threading, winding a bobbin, attaching feet and accessories. Maintenance, adjusting tension, selecting stitches, and stitching them out will also be covered. 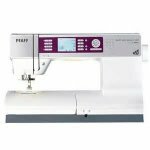 If you don't have a sewing machine or might want a new one, use one of ours to help you decide. We will cover machine basics, how to choose the right threads, needles, fusible webs, and stabilizers. Practice satin stitch, buttonhole stitch, and more. Start with easy exercises and then begin a small quilt or wall hanging that uses your new skills. Machine with zigzag stitch required. This class will take you through the basics of making a quilt: rotary cutting squares and triangles, creating a variety of blocks, then playing with layouts and sewing a top for a small quilt. Finally, we will baste, machine quilt, and bind. Join the fun - step into the world of sewing. You will gain useful sewing skills and learn techniques as you make several projects. Fabric choices for clothing, home decor, quilting and crafting projects will be covered. Do you have a quilt top finished that you need to baste or sandwich in preparation for quilting? Many hands make light work! Learn to baste in a frame, one top each, and more if there is time. Finish quilts with great-looking borders and bindings. Learn to frame your quilts with borders that do not get "wavy". Sheila will teach you to make bias and straight grain bindings, mitered and curved corners. Binding by hand and with a machine will be covered. Bring your sombrero and wear your brightest summer colors! Mexican Munchies, Margaritas, Non-alcoholic Punch, Christmas Fabric, New Christmas samples: decorating & gifts, Free easy-to-make patterns, and Demonstrations!! Join the fun and get a head start on your holiday sewing with inspiring ideas at this popular summer party. Please RSVP. Plan to join us for this fun event focused on sewing, serging, and embroidering for babies. Come for the morning class, or spend the afternoon attending the many demos, or join us for lunch and spend the whole day. In the morning class you will create a beautiful baby blanket while learning to sew fleece and make mitered corners. Personalize your creation with a monogram while you experience the features of Pfaff & Baby Lock embroidery machines. Our afternoon demos and make & takes will be filled with tips, techniques, and tools for sewing cotton, flannel, knit, and fleece items for babies. Expect special pricing on machines during this event, free hand outs, and refreshments. Create a beautiful quilt while learning more about your sewing machine and many different presser feet. Try out many decorative stitches with guided instruction and hands-on practice. Each month explore a new technique like pin tucking, machine applique, couching, sewing on a button by machine, and candlewicking. Karen challenged herself to make blocks with a variety of piecing and design approaches and put them all in one quilt. She chose the theme of owls and a single color story to tie them together. Now she will lead you through your own skill advancing journey. Andrea made a pieced quilt block from an Adinkra symbol of the West African Ashanti people, meaning a secured house. Using both rotary cutting and paper piecing, make a table topper and discover secondary designs that appear when the blocks are joined together. 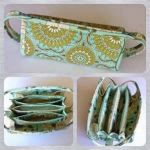 Looking for a quick project that uses your scraps? This class is for you! Greeting cards are fun, creative and a great way to explore new stitches and techniques. All it takes to make this fun area rug is a jelly roll (set of 42, 2 1/2" strips) and strips of cotton batting. It's lots of fun and super customizable. One jelly roll makes a rug approximately 30" x 44". Beginners are welcome. Stitch some dimensional stars for all seasons: tree toppers and ornaments for friends and family, patriotic decorations for summer, or a group of stars to add some fun to a childs room. Pattern and machine with zig zag stitch required. Do you want to make a second tuffet but do not remember all the steps? Bring what you have completed, and Kristin will help you with the little details and assembly. Everyone needs a tuffet, a one-of-a-kind piece of upholstered furniture for your own home or for a great gift. In this two-session workshop, you will sew a tuffet cover and build the upholstered foundation. Put your own spin on this table runner with your fabric choices. Learn to successfully strip piece your selection of fabrics and then cut diamonds using Creative Grids non slip 60 degree Diamond Ruler. Ruler, pattern and machine required. Hand applique is wonderful to see, a pleasure to do, and it is portable! Learn the techniques for invisible needleturn applique and the tricks for mastering all the basic shapes. Kristin will have you hooked. Learn a quick and easy hand quilting stitch, then a hand embroidery stitch that will make binding your quilts lots of fun. Stitch on your own quilt in progress or make a small wall hanging in class. 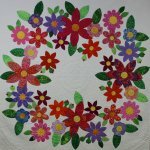 We invite you to attend this group and share in learning the diverse designs, styles, and techniques which English Paper Piecing offers. There is no charge to participate. At each gathering, Linda and Kristin will share with you what is trending in the world of "EPP": the latest tools and gadgets available as well as techniques in basting, sewing, layout and design. Share your tips, findings, and bring your project. If you are new to EPP, please come and see what it is all about. Release your creative spirit! Come explore free form hand embroidery. Learn basic stitches perfect for embellishing your work. Learn the basics of English Paper Piecing and the delight and Zen of hand work. We will explore the many possibilities of using hexies: classic, modern, and trendy. You will create a flower hexie to turn into a trivet, expand into a placemat, or a larger piece. A perfect portable project. Join Pat for an afternoon learning some basic hand embroidery stitches. It is such fun and so portable! 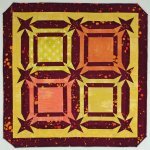 Three preprinted squares of your choice required from The Birdhouse Patchwork Designs. Cork is natural, versatile, renewable, washable, durable, pliable and anti-microbial. It is the new leather! Quilters Corner has a wonderful selection of cork in many colors and sizes. Join Linda as you combine cork with your favorite fabric to create this versatile and useful bag. Learn to "box" the bottom of this bag with cork, put in a lining and insert a zipper. Learn to make this extremely functional bag that can be used for sewing notions to go, for makeup, or to carry in your tote as a "grab-and-go" for a quick trip to shop. It holds an amazing amount! Waxed canvas or waxed fabric has the look of leather with imperfections, but it is much easier to sew. In two sessions you will learn to wax your own cotton canvas fabric and then sew it into a rugged, durable, water resistant, everyday tote. Learning this technique will lead to many new sewing options. To serge or to sew? Who does not love wearing cozy knits! Who is not so comfortable sewing with them? Get started with a primer on sewing with knit fabrics, including what equipment you need (or do not need), the different stitches, and some basic tips to help build your skills and confidence. Learn a lot about sewing with knits, and make a t-shirt in adult or children's size. Nancy is a serger queen, and she will guide you to success. Express your own style and embellish a gently used or new denim shirt/jacket with machine embroidery. Learn about the many types of denim and the use of stabilizers & thread. All levels of experience with machine embroidery are welcome. Join us each month to create and stitch beautiful embroidery designs. We select wonderfully digitized projects from a variety of embroidery design companies: Anita Goodesign, Sweet Pea, Pickle Pie, Urban Threads, Kimberbell, Susan O'Very and more! All levels of embroiderers encouraged. The hands-on embroidery classes will take you from beginner to expert as you learn fabric choices, thread choices, hooping, stabilizers, and techniques. Become fearless about free-motion quilting on your domestic sewing machine. You will learn about basting (without being on your knees), batting options, needle and thread choices, tension, and more. Pat will take the mystery out of the process so you can finish your quilts at home. Learn to stitch on a line, travel, echo and then move on to fun filler designs. Linda will teach you to properly attach the free-motion ruler foot to your machine, then you'll learn to move the fabric while the foot hugs the edge of the ruler. You'll practice using several ruler. With Linda's helpful tips and encouragement, you will soon be creating beautiful designs! So many quilt tops, so little time! Learn the basics of machine quilting, first with a walking foot and then free-motion. You will learn some simple designs that are beginner-friendly so you can finish your quilts with confidence. Quilters Corner is committed to helping you learn the features of your new computerized sewing machine. Second helpings are welcome and cheerfully served. Each session is FREE w/machine purchase from QC OR $125. Top of the Line machine owners can join Linda to expand your knowledge and skills regarding the endless features of your amazing machine. Projects and techniques will be covered. This class is for anyone who has a serger and needs help from the very beginning: basic threading, inserting needles, adjusting tension. Increase your four-thread serging skills: more threading, changing needles, stitch length and width, turning inside and outside corners, making circles, even a casing. Make some gifts, start to finish, all on your serger! It is amazing how much you learn about your machine while making a project. Learn to cut 60 degree diamonds, sew them in diagonal rows and inset side and corner triangles. You will make a lap or baby quilt. A giraffe, an elephant, an owl, a fox! Choose a fabric collage quilt pattern from Laura Heine, and Valerie will help you bring it to life! This is easy enough for a beginner and so much fun! A modern take on string piecing, this pattern offers many design options. To simplify cutting for this topsy-turvy setting, an optional acrylic template is available. Pattern and machine required. Flowering Wreath uses applique to create a beautiful garland of flowers. Learn several methods to approach the applique and then choose your favorite(s). Topics discussed will include fusible, raw edge, finished edge and needleturn applique. Pattern required, template set optional. Are you stuck on a sewing or quilting project? Dedicate some time to sew with other like-minded folks. Bring whatever you wish to work on, and Cyndi will assist. Choose one great fabric and one block shape and make a one-of-a kind quilt. No fussy cutting and no set-in seams. Sew curves quickly and easily, even if curved piecing is new to you. Choose a pattern and fabric using the Quick Curve Ruler or the Mini QCR, and Sheila will show you how! Gather your projects for some dedicated sewing time. Bring your friends or make new ones! Cyndi will assist as needed. As a bonus, she will feature a different scrap quilt each session to give you ideas for busting your scrap basket. String quilts are wonderful for scraps or a favorite pack of strips. Sewing on a mesh foundation produces beautiful results without the worry of precision piecing. Make a Mariner's Compass without paper piecing! Cyndi will lead you through creating your own 18" Mariner's Compass block using a very clever Fat Robin ruler from Robin Ruth Design. Cyndi made a pillow with her block, but you can carry on and make a whole quilt! Owners of Premier Plus or Premier Plus 2, or the full system Ultra are welcome to join anytime for software continuing education. You will explore many techniques and modules and receive a full color lesson handout in our Software Club. Learn core sewing techniques specific to garment sewing. Linda will teach you terminology, pattern selection, layout and cutting options, fabric, thread and needle choices and more, all while sewing your very own skirt. Pattern and machine required. This pattern by Lindsey Rae of Sew To Grow was designed specifically to "grow" your sewing skills. It will fit and flatter a variety of body types and includes sizes XS to 4XL. You will learn to sew flattering front diamond darts, interface a V-Neck, ease in sleeves/shoulder seams, hem a curved back with side slits and then choose from three options for sleeve finishes. Choose one of two shirt patterns by Anna Maria Horner. The simple instructions are written with quilters in mind who do not have experience sewing clothes! Cyndi will help you size, cut and sew your shirt. It is so much fun to wear your favorite fabric!